Some books you just can’t put down, this is one you will have trouble picking up. It’s big, it’s brash, it weighs 1.6 kilos, it is 6 cm thick excluding the covers, it is 796 pages long and it has over a hundred stories in it. 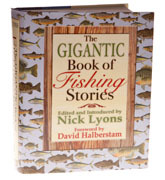 As if that isn't enough, all of the tales have been chosen by a man who has published more books on fishing than most people have read, the incomparable Mr. Nicholas Lyons, an angling giant if there ever was one. If this guy thinks a story is good, then it is good, period. So as you would expect all the usual suspects are here, ranging from Aelian's tale of fly fishing two millennia ago, through the River God, Fish are Such Liars, and G.E.M. Skues' own Mr. Theodore Castwell, which makes a fitting end to the anthology. One of the great advantages of this book is that if by any chance you have reached the age where your arms are getting too short to read things, a generous size of font has been used. No, it isn’t a radical new take on angling literature, and yes, it is heavily biased towards game fish and predators, but if you don’t have the standard anthologies already, it definitely merits consideration and it would make a fine Christmas present for the angler in your life, or failing that, someone in the early stages of weight training. Buy this and you won't need any more anthologies. OK, I lied, but you know what I mean.